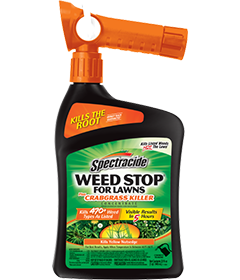 Use Spectracide Weed Stop For Lawns Plus Crabgrass Killer Concentrate (Ready-to-Spray) to kill over 470 types of weeds as listed, including crabgrass. The product produces visible results in 5 hours. This product kills broadleaf and troublesome grass weeds including dandelion, chickweed and clover as well as crabgrass, foxtail and yellow nutsedge, see product label for complete list of weed types. Apply when daytime temperatures are between 45°F and 90°F. Do not apply to Bermudagrass when daytime temperatures exceed 85°F. Do not apply this product in a way that will contact any person or pet, either directly or through drift. Keep people and pets out of the area during application. Do not allow people or pets to enter the treated area until sprays have dried. Do not exceed more than 0.375 lb Sulfentrazone/A per year. Do not treat when air temperatures exceed 90°F, as damage to grass may occur. Application at rates above specified on this label may cause injury to turfgrass. Do not apply this product to food crops (gardens and vegetables), forage crops, or ornamental plants including flowers, trees, shrubs, hedges, woody ornamentals, groundcovers established in landscape plantings and other non-target plants. Do not spray exposed roots of ornamentals and trees. Do not use Spectracide® Weed Stop® For Lawns Plus Crabgrass Killer Concentrate on lawns containing bentgrass, St. Augustinegrass, bahiagrass, centipedegrass or carpetgrass. Also, do not use on dichondra, or lawns with desirable clovers or legumes. Do not use on vegetable gardens, fruits or ornamentals (flowers, trees, groundcovers, hedges, landscape/flower beds and shrubs). See the following table for calculating the correct amount of product to use for the area to be treated. The maximum application rate is 6.5 fl oz of product per 1,000 sq ft per application (0.6 lb 2,4-D acid equivalent per acre per application). The maximum number of broadcast applications is limited to two per year. The maximum seasonal rate is 13 fl oz of product per 1,000 sq ft (1.2 lb 2,4-D acid equivalent per acre), excluding spot treatments. Spray until wet to control weeds. Walk at a steady pace, working back toward the faucet while spraying, using an even sweeping motion, slightly overlapping treated areas. One quart will treat 5,000 sq ft of Southern or Northern grasses. For newly seeded areas: Do not apply within four weeks after seedling emergence of Kentucky bluegrass, fine fescue blends and perennial ryegrass. Apply this product to newly seeded grasses when well-established (approximately six weeks after seedling emergence) or after the third mowing. For newly sodded, sprigged or plugged areas: The application of this product to newly sodded, sprigged or plugged grasses should be delayed until three to four weeks after the sodding, sprigging or plugging operations. Seeding: Turf species listed on this label can be seeded into the treated areas at four weeks after the application of this product. Irrigation: Do not apply this product immediately before rainfall or irrigation. For best results, do not irrigate or water the turfgrass within 24 hours after application. If dry conditions exist, a scheduled irrigation or watering 24 hours before and 24 hours after application is recommended. Mowing: Delay mowing two days before and until two days after the application of this product. Additional stress from low mowing heights may increase the possibility of turf injury. Clippings from the first three mowings should be left on the treated area. Do not use clippings from the treated areas as mulch or compost around flowers, ornamentals or trees in vegetable gardens. Pesticide Storage: Store in a cool, dry area away from heat or open flame. Pesticide Disposal and Container Handling: Nonrefillable container. Do not reuse or refill this container. If empty: Place in trash or offer for recycling if available. If partly filled: Call your local solid waste agency for disposal instructions. Never place unused product down any indoor or outdoor drain. Remove contact lenses, if present, after the first five minutes, then continue rinsing eye. This pesticide is toxic to fish and aquatic invertebrates. Drift and runoff may be hazardous to aquatic organisms in water adjacent to treated areas. To protect the environment, do not allow pesticide to enter or run off into storm drains, drainage ditches, gutters or surface waters. Applying this product in calm weather when rain is not predicted for the next 24 hours will help to ensure that wind or rain does not blow or wash pesticide off the treatment area. Rinsing application equipment over the treated area will help avoid runoff to water bodies or drainage systems.